How much does it matter that investors in the packaged food and coffee company are getting a double-digit dividend increase this year? J. M. Smucker Co. (NYSE:SJM), the packaged food and coffee producer best known for its iconic jams, announced last week that its board of directors approved an increase in its quarterly dividend to $0.75 a share from $0.67 a share -- a juicy 12% hike. The dividend is payable Sept. 1 to shareholders of record on Aug. 12. This marks the 15 consecutive year that the company has raised its dividend. Smucker stock is currently yielding 1.8% over the trailing-12-month period, outpacing snack food giant Mondelez International's (NASDAQ:MDLZ) 1.5% yield, though falling short of North America chocolate king Hershey Co.'s (NYSE:HSY) 2.1% yield. Smucker's dividend yield has traditionally been about the same as Hershey's, though it has fallen behind because of its stock's outperformance over the last year -- a good "problem" to have. 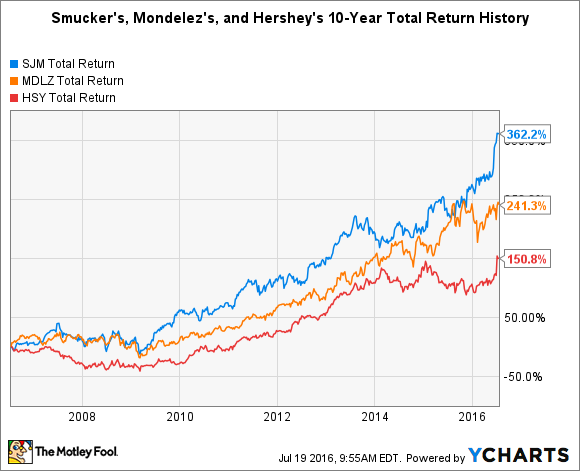 Smucker stock's total return over the one-year period through July 18 is 44%, versus 22.7% for Hershey and 10.2% for Mondelez. Moreover, Hershey's one-year total return was only about 10% until late June, when it shot up because of a takeover offer from Mondelez. It matters considerably that Smucker is raising its dividend this year and has consistently done so over the long term. This fact makes the company's stock more attractive than it would otherwise be and more tempting than the stock of some of its peers or competitors. Smucker's payout ratio (dividends paid to net income) for the trailing-12-month period is about 46%, suggesting it should be able to comfortably afford the dividend hike. 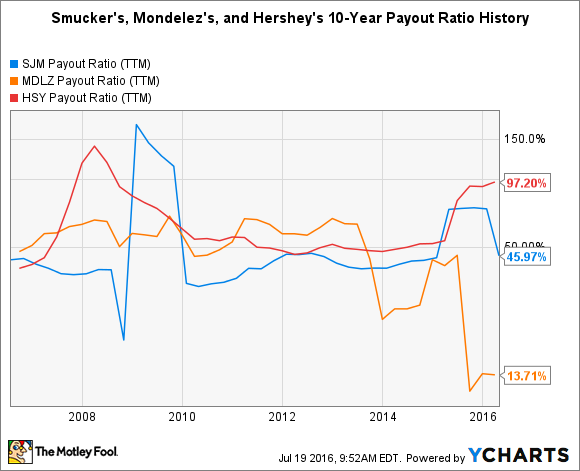 Hershey's dividend yield is currently higher than Smucker's, as previously noted, but this situation shouldn't last for long. Hershey's dividend level does not appear sustainable given its extremely high payout ratio of more than 97%.